I was your neighbor at G10 and admired your boat in the parking lot. Seems like your trailer and formed bunks did their job. Looking forward to watching your progress. This seems like a perfect craft for quiet cruises on small lakes and large ponds. Do you have a place you plan to explore? Yes, Dave, I also enjoyed seeing your Amp Eater at the Gathering! I hope you'll keep us posted on your progress. 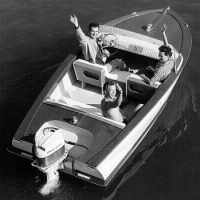 I've always liked the idea of electric boats. I agree! It was great to see Dave's Amp Eater and I'm guessing he's busy working to get it done! I have only have had a few hours to work on it since we've been back. I will get pics posted when I get the chance. We have a nice 2818 acre 9 mile long reservoir near our house that has a 10hp limit, and is also where I sailed for many years with my dad. It is also a great place for viewing birds and for fishing. I still have hopes of getting the boat in the water at least for some testing before the end of October. Matt I hope to catch a ride next year in your Geronimo, and I hope to be busy giving rides as well. The amp eater will be easy to drive and I hope many will get a chance to have some fun driving it. Gayle, I really appreciate the time you spent talking with my wife and I. I have a picture I will post of you and Melissa enjoying Keith's serenade on the dulcimer. It has been a while since my last post but I never was any good at keeping a journal. Cold weather is here to quickly but thanks to a couple of days of Indian summer and some help sanding from my grandsons I got some painting done. Last edited by CaptDave on Tue Nov 15, 2016 11:19 am, edited 1 time in total. Good Help! and Good Going! It has been too cold to work outside in the evenings so we moved to the dining room table. My wife says I have to vacate before Thanksgiving. My son and I are working on the Motor controls and the console. 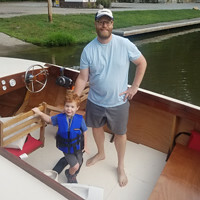 It is always good when building an electric boat to have a son who is an electrical engineer. Motor Controller board wired diagram prepared by Wayne in photo above completed work. It's great to hear from you! Your Amp Eater is coming along--good for you and thank you for keeping us updated. Your son looks just like you! Nice looking boat. I plan to make one (not solar) for my second project. Capt. Dave: I know what you mean about engineering sons. I plan to lean heavily on mine EE son when I start wiring my boat. Everything looks fantastic. From the paint to the wiring and console, first rate! Your boat is coming along fantastically, Dave. The paint job looks great! Cold weather and a busy schedule have made it hard to work on the boat. My son and I erected a 1-'x 20' x 8' Shelterlogic portable garage for the winter storage of the boat. If it is warm enough and time allows I can work on the boat in here and stay dry and protected from the wind. First of all remember that Jesus is the reason for the season. And I am convinced that Jesus shared with us the love of boating and perhaps boat building. After all he was a carpenter and the gospels report that Jesus spent a fair amount of time in boats, I'm sure some of it relaxing and enjoyable. 43 verses in Gospels speak of Our Lords time in boats. Matthew 8:24 and Mark 4:38 recount the time Our Lord was sleeping in the back of the boat even as a storm was raging, and according to the disciples who were in the boat with him, threatening to sink the boat. Luke 5:16 tells us that Jesus would often withdraw to lonely places to pray. And sometimes he would escape the hordes of people in a boat as we read in Mark 6:31-32. It is my hope this Christmas season that Jesus is in your boat that you may weather the storms and enjoy times of peace. Who is mankind that you, God of the universe, creator and sustainer of all things, should be mindful of him? A son of man that you care for him? Yet you sent Jesus your son, whom you made a little lower than the angels for a while, born in humble circumstances, but now crowned with glory and honor because he suffered death, so that by the grace of God he might taste death for everyone. Today we celebrate His coming to earth as one of us that He could be the pathway for us to come unto our heavenly Father, through His perfect life, death and resurrection. For this we celebrate and give our praise, our thanks and our worship to Jesus Christ, the author and perfecter of our faith. Even now we ask that you would help us to live our lives in preparation for his return so that when that glorious day arrives we would be found as his obedient followers. Happy New Year! I have finally been able to work on the boat a little while the weather is moderate in the mid 40's. I have fabricated the motor pivot from angle iron much as detailed in the plans. I mounted the motor and I think all will be well. I just need to put in the belt tensioning bolt, install the prop shaft, belts and sheaves, and I will be ready for a test. The large diameter of my motor makes for a close fit. The motor is not all that big but it is fairly heavy at about 30 lbs... enough to make you sweat as you are holding with one hand and putting bolts in with the other. Last edited by CaptDave on Mon Jan 09, 2017 10:56 am, edited 1 time in total.